The Black-headed Caique has a very active nature ...guaranteed to get into anything and everything it can! The Black-headed Caique is not only one of the most colorful birds in the parrot family, but has a delightful and comical personality. They are very intelligent and quick to learn tricks. They can mimic many environmental sounds but Caiques in general are not known to be good talkers. Being quite social and outgoing, they are affectionate and inquisitive, and they love to show off. A distinguishing characteristic of the Caique is a lovely ruffled looking white breast and belly. This gave rise to it's name. 'Caique' is a term used to describe a full-dress, white shirt, with a ruffled front. Distribution: The Black-headed Caique is found in South America north of the Amazon, from the Guianas westward to Colombia, Venezuela, and Peru. They inhabit the tree tops of tropical and savannah forests. 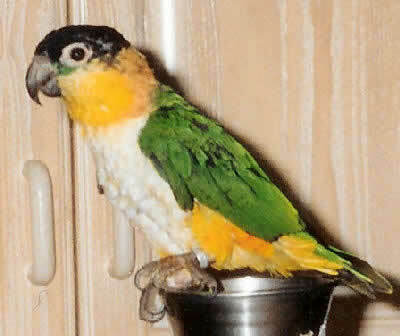 Description: Black-headed Caique has a mostly black head with the cheeks, throat, thighs and flanks an orange-yellow. They also have an orange band across the hind neck bordered by a few bluish feathers. The back, wings, rump and upper tail are green and the breast and belly are creamy-white. The tip of the tail is yellow. The beak is gray-black and the eyes are orangish-red. On juveniles the underside is more yellow, all orange and yellow parts are paler, the beak is horn colored, and the eye is dark brown. Size - Weight: Mature birds are about 9" (23cm) long from the head to the tip of the tail. Care and feeding: A roomy cage is required unless the bird is to be let out for extended periods. Many birds can spend a good deal of their time on a play pen or parrot perch. In the wild these birds eat fruits, seeds, and berries from the tree tops. The Caique's main diet should primarily be seeds, fruits, and green vegetables. A commercially prepared parrot mix or pelleted diet can also be beneficial. See About Caique Parrots: Housing and About Caique Parrots: Care and Feeding for more information. Social Behaviors: Caiques enjoy human interaction as well as interaction with other birds. In the wild the Black-headed Caiques are very social birds usually seen in family groups or flocks of up to thirty birds. They are highly social birds with a very active nature.They will require a lot of interaction with either you or from another companion. They are very intelligent, energetic, and constantly on the move. Love to climb, play, and chew. They will get into anything and everything made available to them. Provide lots of toys and branches, and rotate new bird toys on a regular basis. Breeding/Reproduction: Black-headed Caiques are being bred successfully in captivity. The female will lay up to four eggs which incubate for about 25 days. The male will feed the female while she is brooding, and will join her in the nest box at various times during the day and at night. The hatchlings will leave the nest at about 14 weeks. Availability: Caiques in general have not been as available as other parrot species and are often quite a bit more expensive. However, the Black-headed Caique is well established and popular as both a pet and aviary bird and is frequently available. I have read a few of your comments and see some of you have got a caique so you must know alot about them. Iam intreseged in buying a bird,maybe a caique,so i have a few questions for you: Do caiques sing at night? Or do they sleep? Do they need alot of care, including playing? I used to own a caique. He was a very intelligent bird. Rico was a huge handful and grew tired of men with beards. He would fly and try to attack, usually aiming for the neck. Other than that aggressiveness, he was a great pet. Rico loved to eat and drink anything I had. He did make a lot of sound but hardly any tonight. At night he would make little peeping noises but not all night long. We covered his cage with a blanket every night because when it's pitch black they don't make as much noise at night. We clipped his wings so that he could only glide around out side. Most bird owners would never let their flying birds outside but the truth is, when you've got them trained they are amazing pets. He was very interested in everything. His best friend was a guinea pig and he would mimick the sound. You need to feed and water them everyday with snacks daily. Rico would often just eat with me at the table with his own portion of our human food. He loved to play with hands and play bite. He never bit hard when we were playing. The more you handle them the better pet they will be. Talk to them everyday and teach them thank you and please. Rico would mimick the sound in a low whistle. He was a very well mannered bird. They are like two year old kids, when they are quiet they are usually getting into something and being destructive. Always have toys your bird can take his/her anger out on insted of you. They tend to bite when they don't get what they want, like a 2yr old throwing a fit. Overall caiques make a wonderful companion and are capable of mimicking your tone and syllables in words to talk to you. They take baths about once a week in their water so if you don't want the mess take them in the shower with you. They like shiny things so they might try to pull peircings out. He was a great bird with my nephew. But sadly he was too intersested in our 9 puppies playing (we were breeding dogs at the time) and he flew down and they attacked him and he passed away. My family is going to get another one because the caique is a genuine bird full of enthusiasm. I would not recommend this type of bird for your first bird. Start with a budgie, they are similar in personality. Although budgies can talk and caiques cannot they make the same noises and need just as much attention to make a tamed great companion. I hope my info about my previous ownership of my bird helped you choose the best ways to raise your caique! Enjoy your baby! No signing at night. Ours is NOT covered, but the room is dark. He will wake with sun or hearing us walking around. He gets hungry..lol. They are not a lot of work but with any animal needs daily attention and love. Cleaning the cage is the worst. They are easier than dogs by far....not as easy as cats. Reading is good...they are not a "demanding bird" like cockatoos or amazons or even ringnecks/alexandrians-they are funny! I have a black head Caique and LOVE him. He is very social. He says words like peak a boo and luv you, makes kissing noises, says hi and lifts his foot. He is not a creature of habbit...we change things up all the time. We have a 'play' cage that he uses with special treats and that works well with socializing him with people when we are all together. He is out often dancing around and he even cuddles...(with my daughter). He loves to walk thru my hair...no hairspray for me. They make great pets-they can be loud, but overall very calm and fun. I love our bird and he is one of a couple parrots we have had. Socialization is the key! I have a black headed caique and can only endorse what is written here, the caique is not for the faint hearted or for someone not at home It needs lots of interaction and remember to make sure you have your neck and arms well covered. Hair, clothes, and spectacles make good surfing objects. Alot of fun and can be noisy. i have two pairs of black headed caique they are very loving & affectionate, breeding twice a year. Great. My caiques would breed and they were also my pets. The caiques and conures were sooo happy to show me their little eggs and yet come out to give me kisses.